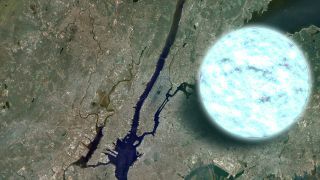 A neutron star can be the size of the city with a mass greater than that of the sun. A theoretical quark star would be even denser. Your body is made of cells. Zoom into those cells, and you'll find a bunch of molecules, which are composed of atoms. Focus on the nuclei of those atoms, and you'll see the protons and neutrons. Crack one of those open, and out pop the quarks, the teensy-tiny fundamental bits that combine in interesting ways to form the heavier, and more familiar, particles that make up our everyday experience. You can also encounter strange sources of pressure in unexpected situations. For example, if you were to take a cloud of random electrons and cool it to absolute zero (I know that isn't possible — but this is a thought experiment, so work with me here), you would expect the pressure to drop to zero, too. It is, after all, just a gas, where pressure is related to temperature. But instead, nature plays a trick, and you'll find yourself being resisted just as strongly, if not more so, than if you were trying to squeeze a rock. That pressure comes from an unexpected quirk of quantum mechanics. There are two kinds of fundamental building blocks in the universe: fermions (like electrons and quarks) and bosons (think photons). And the single property that separates the constituents of the cosmos into those two camps is how they behave when we attempt to combine their quantum states. This term, "quantum state," just refers to the list of numbers that we use to describe a particle in a particular system: its energy level, angular momentum, spin orientation, and so on. And it turns out that no two fermions can occupy the same quantum state: They can never share the same set of descriptive quantum numbers in a system, while bosons are completely free to do so. At first, this was just a postulated rule of nature based on experimental evidence, but its origins are in the link between quantum mechanics and special relativity … and that's yet another article. This means that, if you squeeze two fermions together at absolute zero, both fermions can't occupy the same zero-energy ground state. One must have a different configuration, such as a higher energy or different spin orientation, than the other. There's just no way around it — it's baked into the basic configuration of our universe. That means a whole bunch of electrons, even cooled to absolute zero, will emphatically not have zero energy, and that energy will manifest as a pressure resisting further collapse. Even if you're not at absolute zero (because you never will be), the electrons can still have a strong pressure. Particles in this sort of situation are said to be in a "degenerate" state. When this happens in nature, like in the core of a dead star, we get a white dwarf. But that pressure can be overwhelmed, too. If the gravity is too strong (specifically, if the mass of the white dwarf exceeds 140 percent the mass of the sun), the electron "degeneracy pressure" can't compete, and the white dwarf collapses. But it's not quite a one-way trip to catastrophic collapse and the doom of a black-hole singularity. During a massive compression event, electrons can get shoved inside any errant protons, converting them into bonus neutrons. With almost all the material inside the star converted into a dense neutron soup, further collapse is prevented by the neutron degeneracy pressure, capable of forming a remnant core a couple of times the mass of the sun but no bigger than a small town: a neutron star. Neutron stars have a weight limit too, but that number is a little harder to pin down because we're not exactly clear on the confusing physics happening deep inside their cores. But we do have a rough guess, and it's somewhere around three times the mass of the sun. If it reaches that mass, something's got to give. So is that it? Does a collapsing massive object ride the train straight from a neutron star to a black hole, or are there any other stops? Theoretically, it's hard to tell. We really don't understand quark-level physics very well. Part of the problem is that quarks are shy and refuse to be seen individually; they're only in groups. So we can't just ask a single quark what it likes to do for fun. And the physics of grouped quarks are hideously complex — we simply don't know if they can form stable structures at the scales we need. Observationally it's hard to tell, too. From the outside and from far away (i.e., from Earth), a quark star would look pretty much like a neutron star: a massive compact object spewing radiation and hosting crazy-strong magnetic fields. There might be some tiny, nearly inscrutable differences in their electromagnetic signature but nothing that's easy to detect — otherwise, well, we would've found some by now. And maybe neutron stars actually host a quark-supported core in their centers — but, like I said, we don't understand the physics very well. If quark stars do indeed exist, they must be very rare, since it's a very narrow window between the conditions needed to make a regular vanilla neutron star and a full-on black hole. So even if we crack the math and figure out that quark stars are technically allowed by the known laws of physics, it's likely that nature doesn't really care for them, and we'll end up not finding one anyway. Learn more by listening to the episode "Can We Have some Quark Stars, Please?" on the Ask A Spaceman podcast, available on iTunes and on the Web at askaspaceman.com. Thanks to @wiegeabo, @ShamanicPistol and Larry B. for the questions that led to this piece! Ask your own question on Twitter using #AskASpaceman or by following Paul @PaulMattSutter and facebook.com/PaulMattSutter.